This section applies to the new style Map widget, i.e. 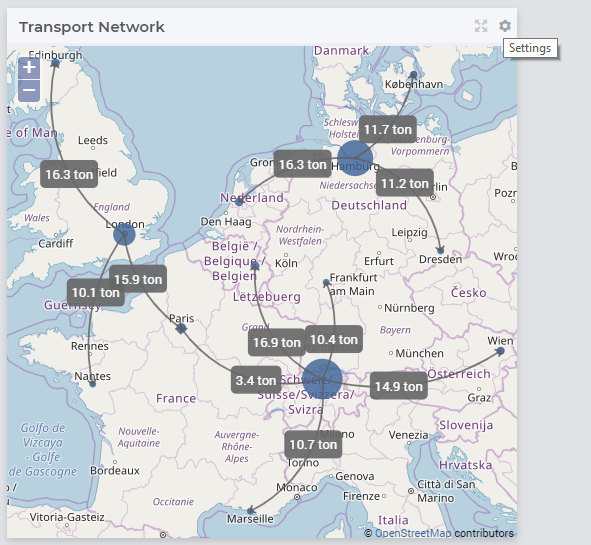 the map widget available in software versions from AIMMS 4.61 onwards. 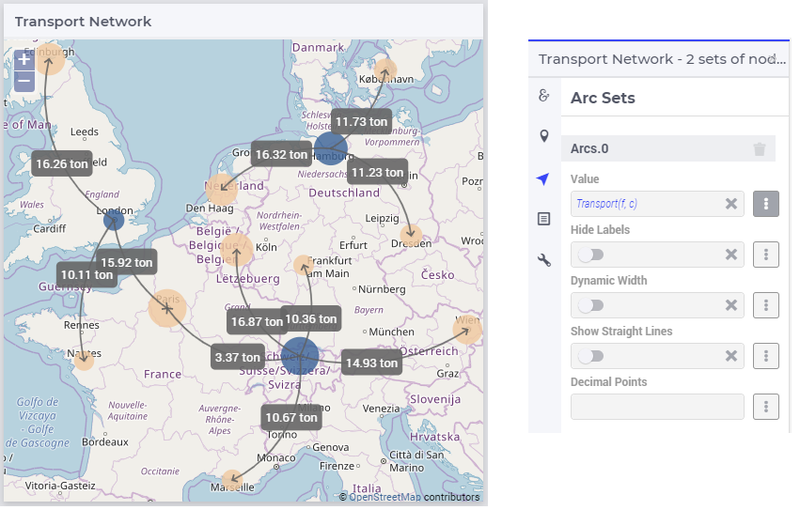 The network with nodes and arcs on top of the map must be defined in terms of identifiers declared in the AIMMS model. In this section we illustrate how to create, configure, and use such a map widget rendering a network in the AIMMS WebUI. 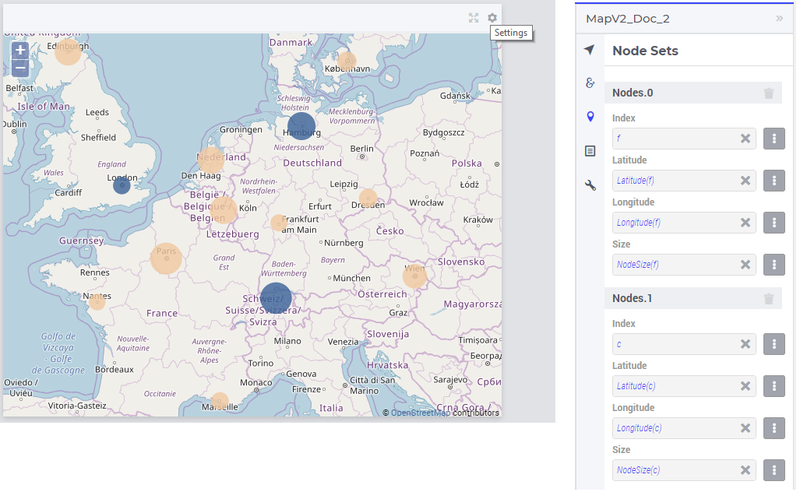 We also provide some guidelines and best practices for the map widget usage at the end of this section, please consider them before employing the map widget within your application. A map widget can be added to a page using the same steps as for any other widget, see adding a new widget. After adding the map widget in the Widget Manager one can click on its Settings wheel in order to configure the widget. 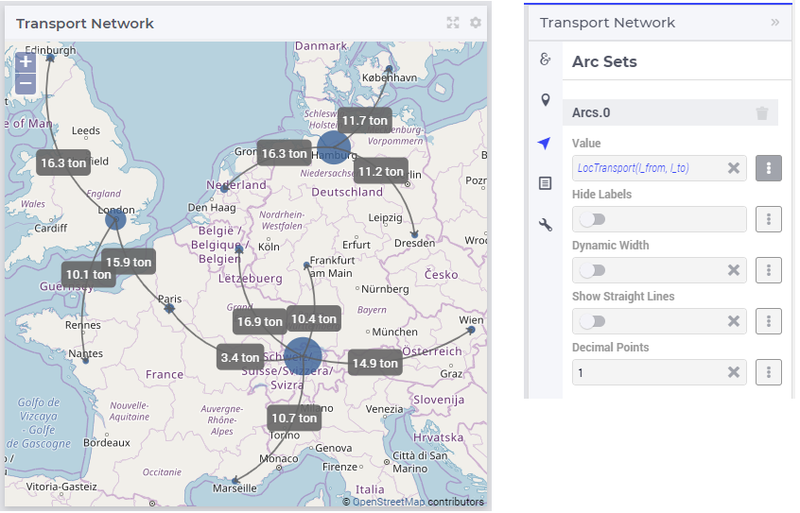 Node Sets: Multiple node sets can be added here. Arc Sets: Multiple arc sets can be added here. Miscellaneous: Title, Zoom, Center Latitude, Center Longitude and Visibility can be controlled here. Advanced: Advanced options for this widget are available here. The Latitude and Longitude must be specified by two separate identifiers declared in the model. The values of the Latitude and the Longitude parameters must be within the geographical bounds, i.e. between (-90,90) and (-180,180), respectively. Not keeping the Latitude and the Longitude within these bounds can lead to unexpected or unresponsive behavior of the Map widget. In order to avoid such undesirable behavior, one can specify the bounds intervals in the Range attributes of the corresponding identifiers in the model. The default node size radius is 3 px. 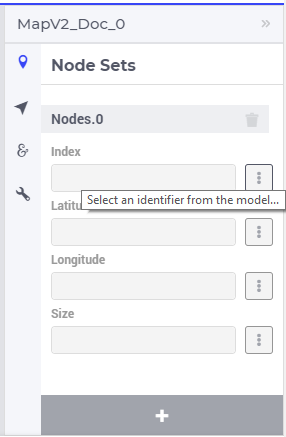 One can set a dynamic node size to each node set by selecting an appropriate identifier for the Size parameter in the desired node set (the index domain of such a parameter must be the same as the index of the node set). 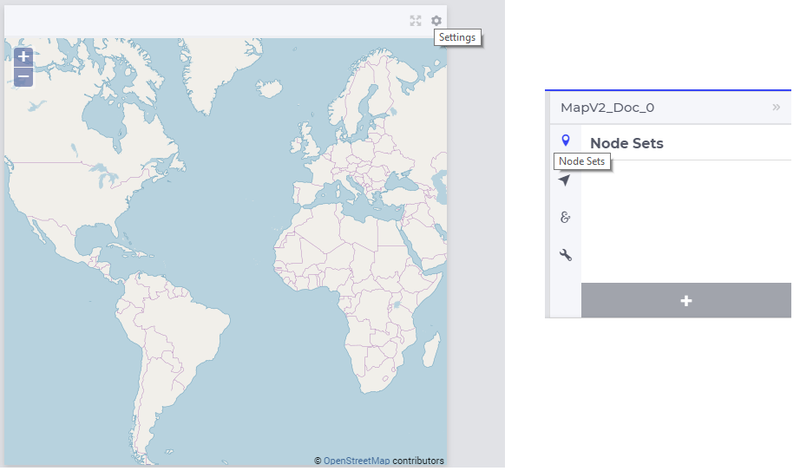 Nodes on the map widget also have the functionality to store focus. This means that one can store the value of a selected node in the network in an element parameter declared in the model. 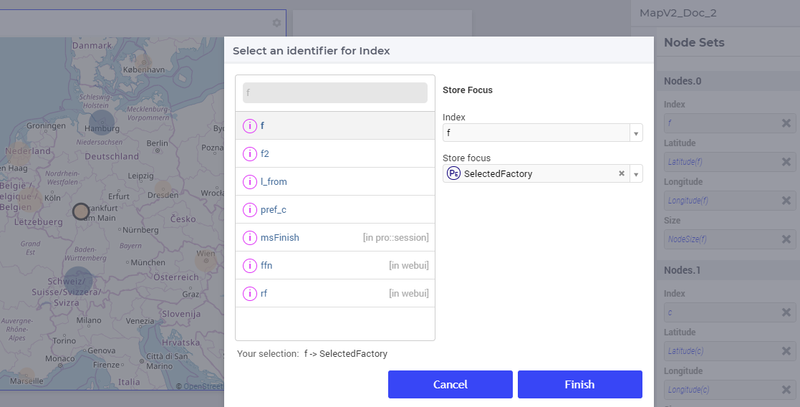 The store focus functionality opens up various interaction possibilities, because the value of the element parameter may be further used by other widgets or may impact some parts of the model execution. While adding the index for the node set, one will notice an option for “Store focus”. Here an element parameter may be specified which will store the value of the node selected upon clicking in the network. Note that, when a node has been selected, the user may still hover over another node and inspect the tooltip information, in the same way as the hovering works when no node has been selected (remark: a selected node may be unselected by clicking on it again). The hover effect is that the node which is hovered over has a thin outline. 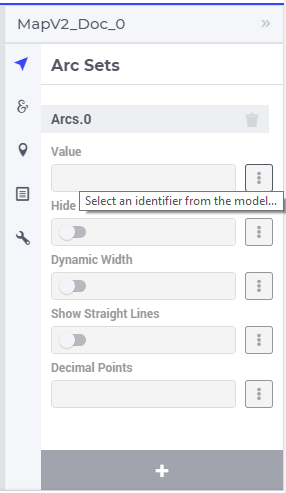 Value: Select the 2-dimensional identifier which defines the arc set. The arcs will be drawn and the labels with the values will be displayed for each arc. Hide Labels: Switch this on in order to hide the arc labels. Dynamic Arc Width: This option controls whether the arc width is fixed or dynamic. Dynamic arc width accounts for the values that are defined in the “Value” field of the current arc set. Show Straight Lines: Switch this on in order to turn the curved arcs into straight lines. Decimal Points: Specify the number of decimals to be shown for the values of the arc labels. The arc identifier must be a 2-dimensional identifier like ArcFlow(i,j) where i and j are indexes of some node sets or subsets thereof. Note that, except for the “Value” field, all other options can be controlled either by constant values or by using scalar parameters declared in the model. So, in this latter case the arcs are drawn between nodes belonging to two different node sets. 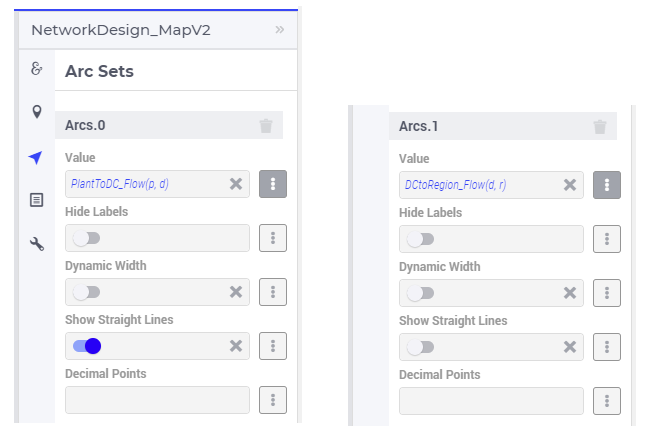 For the map widget in order to be able to render multiple arc sets correctly the conditions in this note must be satisfied. For any two different arc sets, with their sets of source nodes originating in different node sets (as specified in the “Node Sets” section of the widget options), these node sets should not contain any elements with the same element names. The same should hold true for sets of destination nodes of any two different arc sets. Applying this note to the source nodes in our example here at hand means that the set of plants p and the set of distribution d centers should not contain any elements with the same element names. 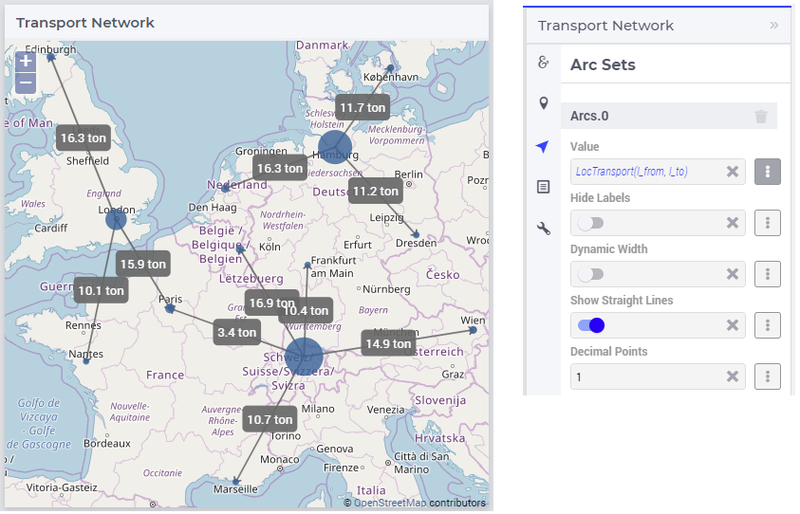 In the same vein, when considering the destinations nodes, the set of distribution centers d and the set of customer regions r should not contain any elements with the same element names. Zoom: One can set a zoom level to start with or control this via an identifier. When the map loads for the end user it starts off at the defined zoom level. The zoom level can be set between 2 (max zoom out) to 18 (max zoom in). 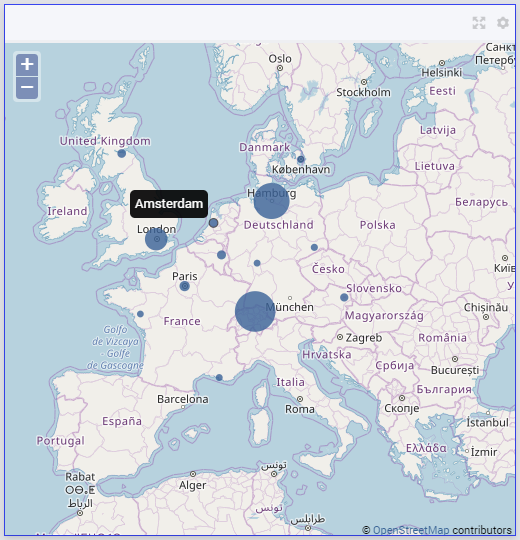 One can also have max zoom out level as 0 or 1, but only when the size of the map is smaller than 5 columns in width. 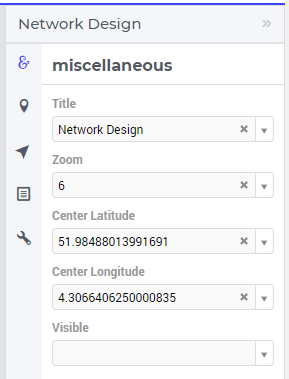 Center: The “center” option is split into 2 options, “Center Latitude” and “Center Longitude”. Similarly to the zoom option, if one sets the Center Latitude and Center Longitude, then the initial load will start from that “center” point. One can also control this option via identifiers in the model. Visible: Specify whether or not the widget is visible on the page. This option may also be controlled using a model identifier. 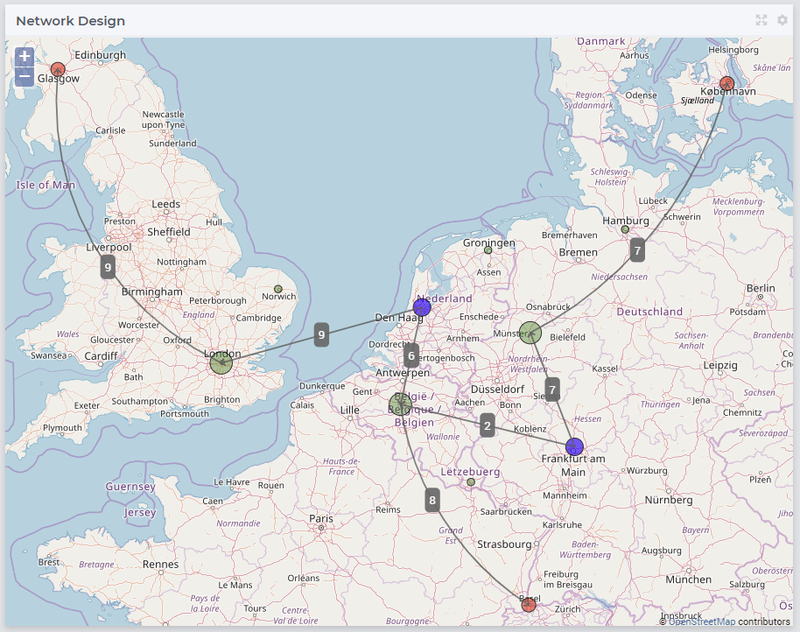 If your widget has been created in the past by using an older type Map widget, you may continue to use this widget as is, but it is not possible to upgrade the widget from an older Map type to the current Map type by just changing the widget type in the Advanced options. 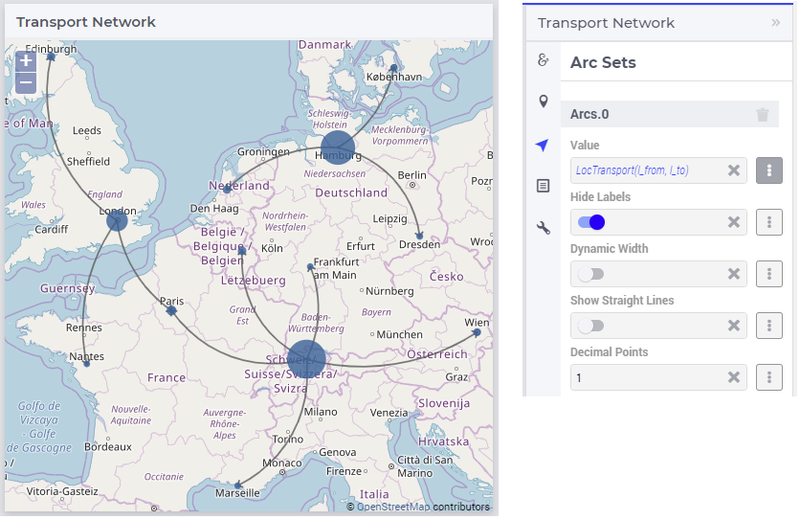 In order to use the current Map type, the node and arc sets have to be added explicitly to the widget using the style described in this section. 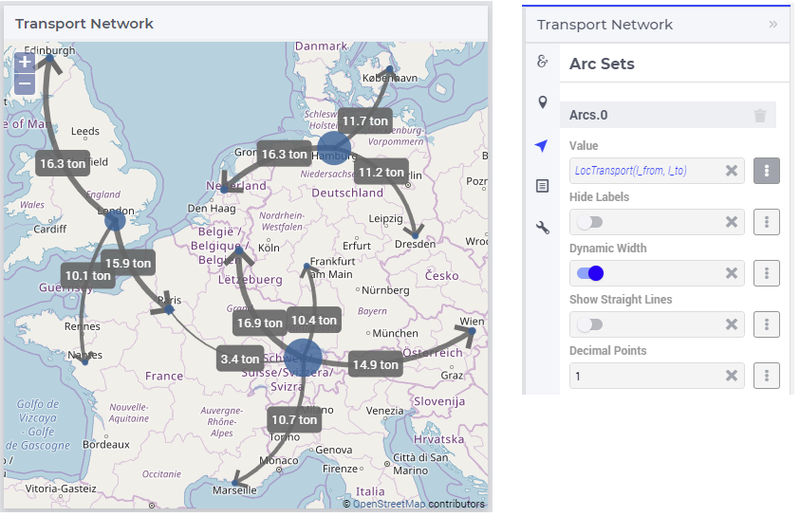 While using the map widget, there are some pointers on how to leverage the features in order to represent data efficiently. The capacity and performance of the map widget is dependent on the specifications of your user’s machine, server and database speed, and the browser being used, among other factors. A good practice is to show (only) slices of the data which may be visualized comfortably by the end-user, who should be able to grasp the meaning of data and derive information from it.